Home / Android / Android App / Casual Games / Games / Hypno Rings / Hypno Rings – Rule the Rings! Hypno Rings – Rule the Rings! What do you do when you’ve scored a break from work, are waiting for a bus or have just managed to find a bit of downtime while waiting for something? Do you pull out your phone and pass the time that way? If so, what are you doing? Reading Reddit, RSS feeds or eBooks? Or do you prefer to play games? For those of you who love to play games in these random idle moments, we have the perfect suggestion. 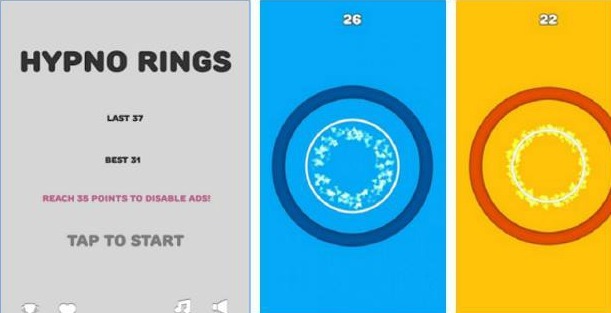 We’re happy to present to you one of the most entertaining casual gaming apps on the Android platform - Hypno Rings. Developed by PopSoda Digital Commerce, this game is full of unique features, like its overall design and music. It is compatible with all devices with Android 2.3 and up. soundtracks hypnotize you because you will lose the game. Restart it how many times you like and have an endless fun by downloading it for free from Google Play. Note that if you reach 35 points you will disable all of the ads in the game.